Has your office planned its EURO 2016 sweepstake yet? It's the spring, there's a major football tournament coming up and, well... you can probably guess on the basis of past experience, what's going to happen next. There will be incredible demand for any remaining tickets for the most hotly-anticipated matches, the pubs will be full of sweating, beer-swilling fans and you will have decided to organise a sweepstake in your office. But when you gather your own employees around the table for your company's EURO 2016 sweepstake, what will you need to do to ensure it all goes as well as a Cesc Fabregas pass, rather than as badly as a Louis van Gaal team selection? Download your sweepstake at Profit Accumulator! 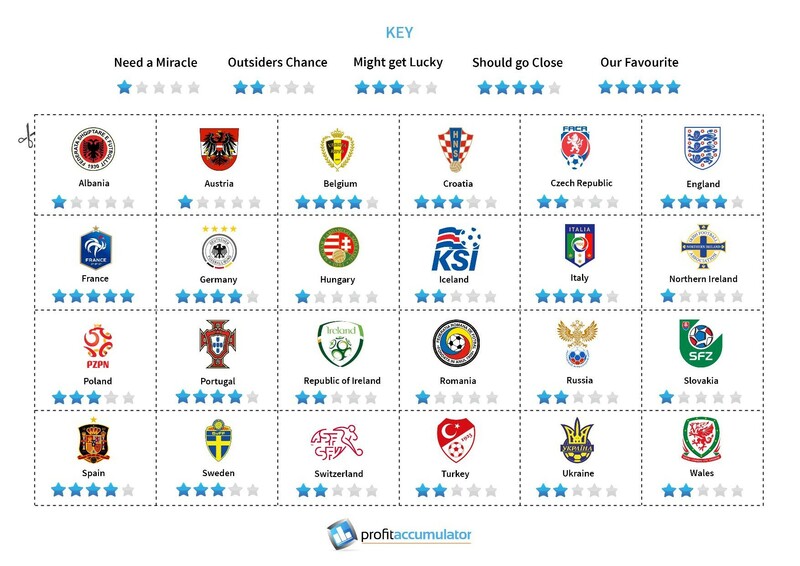 Thankfully, we've taken much of the hard work out of your hands here at Profit Accumulator, by creating the perfect EURO 2016 sweepstake kit for you. All that you need to do is download our pre-prepared sweepstake below, print it out, cut out the names of the teams and begin sharing them out among your staffers. But wait, aren't there any rules to this kind of thing? Ah, yes... that's a fair point. Basically, if you've never done the whole sweepstake thing before, this is the type of contest where all of the participants pay for a ticket that entitles them to a randomly selected team in the given sporting event - in this case, EURO 2016. All of the money paid for tickets contributes to what is known as the 'kitty', with a limited number of people - perhaps the person whose team wins the tournament, or those who selected the eventual top three ranking teams - taking all of the cash. It's a very simple premise, with the team names typically being drawn from a hat or container and a note made (such as on the sweepstake graphic that you have downloaded from Profit Accumulator) of who has drawn which team. That said, as hard as it might be to believe, it's not unheard-of for some humble businesses just like yours to inadvertently hold illegal sweepstakes. As the Gambling Commission has outlined in its own detailed advice, the small-scale sweepstakes that are typically run in workplaces tend to be considered as "work lotteries" under the Gambling Act 2005, and therefore do not require a licence. However, there are still some general rules that you need to follow when running an office sweepstake, so we suggest that you read the Gambling Commission's guidance on organising small lotteries before proceeding with your own event. Enter your Name and Email below and click Download! Again, this isn't too complicated. You can charge whatever price you like for your Euro 2016 sweepstake tickets, but we would recommend a price of £2 each. With 24 teams set to do battle in France, that would give you a healthy total prize fund of £48 - more than enough to convince even the most football-phobic members of your staff to enter! Now, in terms of how you distribute the winnings, you have several options. You could make your EURO 2016 sweepstake a true "winner takes all" one by giving the £48 to the person whose team lifts the coveted Henri Delaunay Trophy at the Stade de France Final on 10th July - but this might not create much incentive for those more hesitant entrants who don't fancy their chances. In the interests of the most inclusive sweepstake, we would therefore personally recommend that you divide the winnings in some appropriate way among those four entrants whose teams reach the semi-finals. Unlike the World Cup, the European Championships don't have a third place play-off, so it's difficult to devise a top three, unless you come up with your own tie-breaker between the two losing semi-finalists (for example, total number of goals scored over the tournament). But how, exactly, should those winnings could be distributed? Well, using our previous example of a £48 kitty, what about £24 for the winner, £12 for the tournament runner-up and £6 each for the two unsuccessful semi-finalists? We will naturally leave you to decide on your own system, depending on how you price your tickets. We'll also give you another helpful tip about sorting out the kitty - keep the already-selected teams secret when you are encouraging people to enter. You might struggle to sell all of the tickets if potential participants know the only ones left are for Iceland, Albania and Northern Ireland! Yeah, we know it's been a football season for outsiders, but Jamie Vardy doesn't play for any of them. So, everyone knows their teams... how to follow the action? If you are fortunate (or unfortunate - after all, we all know how knackered Wayne Rooney now is) enough to land England as your team, you won't exactly struggle to find coverage of Hodgson, Neville and co's efforts - just walk into your nearest pub when England kick off their first game against Russia on the evening of Saturday 11th June. If, however, your randomly selected team is among the more obscure contenders in France, you can put your football hipster cap on as you get to work on distinguishing your Pantilimons from your Pintiliis (two of Romania's leading lights, if you really must know) and your Burgstallers from your Baumgartlingers (Austria). Some matches do clash - for example, it might be tricky to find a decent venue showing the Ukraine vs Poland match on the 21st when Northern Ireland will also be locking horns against Germany at the same kick-off time. But for the most part, thanks to the wonders of TV, radio and the Internet, keeping up to date with what's happening shouldn't be too difficult. 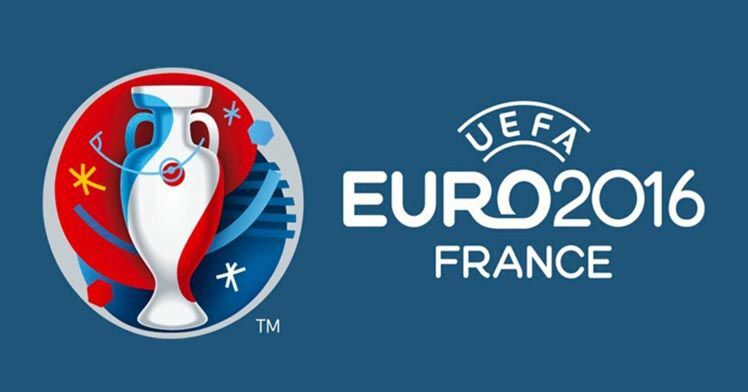 TV broadcasts of the EURO 2016 matches here in the UK have been split between BBC and ITV, with the latter airing the much-anticipated opener between France and Romania at 8pm UK time on Friday 10th June. As you may already know if you have searched for other EURO 2016 sweepstakes around the web, there are some pretty complicated ones out there. We've therefore gone out of our way here at Profit Accumulator to put together the most easy-to-understand EURO 2016 template. 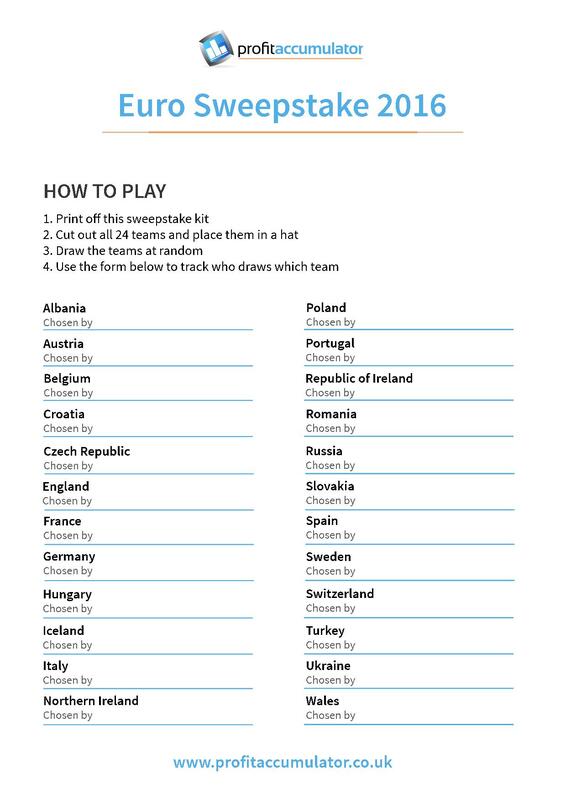 Just download our EURO 2016 template above, print it off, cut out all of the 24 teams and place them into a hat. Then, when your participants draw their teams at random, you can make a note of who has chosen each team on the first page of the template. It really is that simple! Time for a bit of betting - who are the favourites? Finally, there's the small matter of what we're here for here at Profit Accumulator... a bit of good old fashioned betting. Indeed, whether you plan to use EURO 2016 as a focal point for your usual sports betting activities or instead introduce yourself to the practice of matched betting that doesn't constitute gambling at all, the tournament is currently offering some very tempting odds. Unsurprisingly, the home team are highly fancied for success on their own turf - William Hill, BetVictor and Sky Bet all have Les Bleus at 3/1, Paddy Power rate them at 7/2 and the Coral verdict is 11/4. World Champions Germany are also high in the reckoning, at 3/1 with bet365 and 7/2 at Paddy Power, William Hill and Sky Bet. All of the traditional European giants that actually qualified for the tournament (sorry, Netherlands) feature towards the top of the odds rankings, with Spain, Belgium, Italy and Portugal all fancied to differing degrees. If you're wondering where England are, well, they're in their perennial somehow-among-the-favourites-despite-rarely-actually-winning-anything role, the major bookmakers consistently grading them at 9/1 or 8/1. 'Tis the summer to hold a sweepstake! But of course, if any football season has been one in which to throw all bookmakers' opinions out of the window, it has to be this one, in which we are presently witnessing the once exceedingly improbable prospect of a Leicester City vs Tottenham Premier League title fight. Plus, it's hardly as if the European championships have been shy to spring a few shocks of their own down the decades, with Denmark in 1992 and Greece in 2004 among the past victors to have been extremely un-fancied pre-tournament. So, for once, throw caution to the wind - put on that EURO 2016 sweepstake and invite all of your colleagues to put down some cold, hard cash for a ticket. 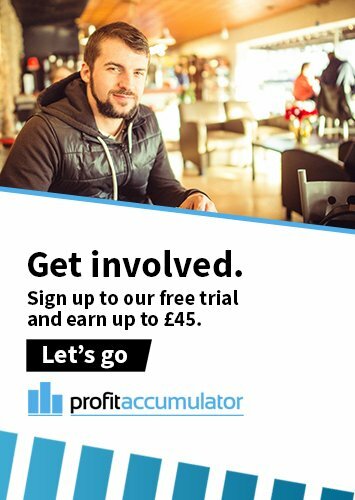 Just don't take the same approach to sports betting in general - instead of simply gambling away your hard-earned money, sign up to Profit Accumulator today to discover how by placing matched bets on this summer's action and beyond, you could be several thousand pounds' more in the black every single month.